The report surveyed more than 330 respondents from the U.S. healthcare industry to gain deeper insight into the use of Virtual Desktop Infrastructure (VDI), the uptake of lower-cost endpoints such as zero clients and the benefits of deploying single sign-on (SSO) to access virtual desktops. The industry-wide shift from paper-based to electronic records has created the need for technology that meets both clinical workflow and IT requirements. Providers need access to patient data at the point care, and IT needs efficient, secure and cost-effective solutions. This dynamic has created demand for desktop virtualization because it gives healthcare providers roaming access to clinical applications and patient information while also improving security and supporting HIPAA compliance by keeping protected health information (PHI) centralized instead of distributed on PCs, laptops, tablets and smartphones throughout the hospital. 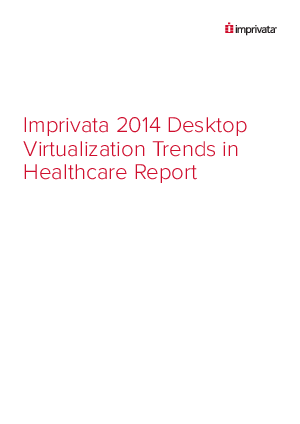 Consequently, adoption of VDI in healthcare has increased substantially from 35 percent when Imprivata published the inaugural report in 2011 to 52 percent in 2014, with a forecast of 65 percent adoption within two years. In addition, healthcare’s highly mobile workforce, stringent compliance regulations on data security and intense pressure to reduce spending while at the same time increasing provider productivity make the industry particularly well-suited to take advantage of VDI coupled with fast, secure authentication and access management solutions. Accordingly, 84 percent of survey respondents indicate their organization will use SSO within their VDI environments over the next 24 months.